Two years ago, Simon Pinela watched as the Villanova Wildcats win the national championship on a buzzer beater. He was a junior in high school, and it sparked an interest in Villanova as a college choice. Monday night, the Connecticut native—now a Villanova freshman—watched his Wildcats win the national championship in a rout. 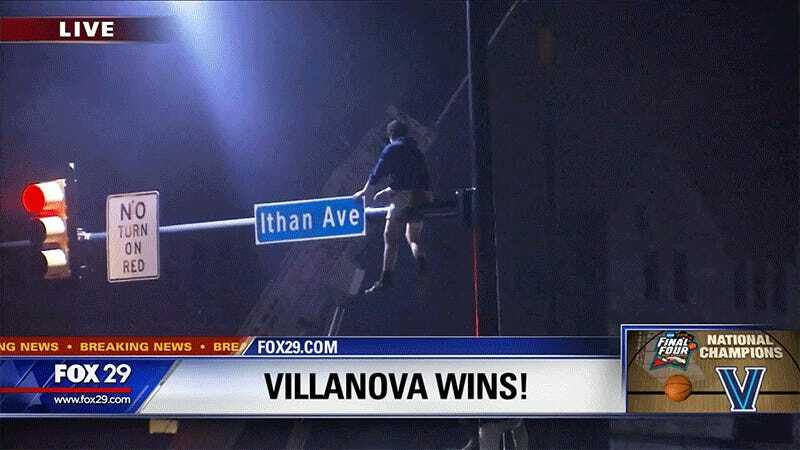 He did what any sensible college freshman would do: climbed a pole at Lancaster and Ithan avenues, the main intersection on Villanova’s campus, to celebrate. His feat made it on every local news station, with a NBC 10 helicopter circling him for more than 10 minutes as it filmed the on-campus celebration. He’s famous now, kind of! Deadspin caught up with Pinela to ask him about climbing a pole after his team won the national championship. This interview has been lightly edited for style and clarity. How did you end up at Villanova? What first caught my attention, and probably a majority of the people who are freshman my year, was the win in 2016 for basketball. Then I looked a little more into it, and it was the perfect size—I didn’t want a big college. The campus wasn’t that big; you could walk the length of the campus in about 20 minutes which is perfect. I loved the feel of campus, their sports teams, the student/teacher ratio—it was everything I wanted. What did you do for the title game on Monday? I watched outside at the Oreo [the nickname of a sculpture on Villanova’s campus]. They had two big screens on each side of a huge stack of speakers. What was the atmosphere on campus like after they won the game? From the three-minute mark people were jumping up and down. When the final buzzer went off, everyone started really jumping, yelling, moving around. Immediately, everyone started started going toward the intersection at the quad, between the two sophomore buildings, and the main intersection. So you went to the intersection of Lancaster and Ithan avenues. What made you want to get up on the traffic pole? I’m not sure. I honestly don’t really know. I saw some people climbing it. I went to downtown Philly for the Super Bowl win, and there were a bunch of people climbing poles. So I just thought: Why not? If I can do it, I might as well try. Do you have any experience in climbing? Not real rock climbing or anything, but I’ve been able to climb stuff. I consider myself fairly athletic. So was it hard getting up on the pole? It wasn’t as hard as you would really think. Some people gave me a little boost to get up [onto the walk/don’t walk signs], and then I just had to get myself up the pole. I just grabbed onto the top and lifted myself up. What was it like being up there? It looked like people were throwing things at you. Yeah, there was a roll of toilet paper that people kept throwing at me. It was weird, I thought. I ended up catching it. Stuff was just coming from every direction. People were everywhere. There was a fire in the middle of the street. The helicopter was up there going around. So how long were you up there, and how did you get down? It was about 20 minutes. And I just shimmied to the end and then just slid down to the walk/don’t walk boxes, and then jumped off from there. It was pretty easy. Now, you were wearing shorts this whole time. Was it cold? After the first 15 minutes, it was pretty cold. Do you wear shorts all the time? Yeah. Other than having to wear pants for chem and bio lab, I’m pretty much in shorts all the time. You may be from Connecticut, but that attitude is pure Philadelphian.